Enjoy your stay in our bright and luxurious upstairs 2 bedroom, 2 bathroom condo. This is the true Venice Beach experience! Perfectly located on a quiet street only one block from the beach and walking distance to dining and entertainment! Free on-site parking included! 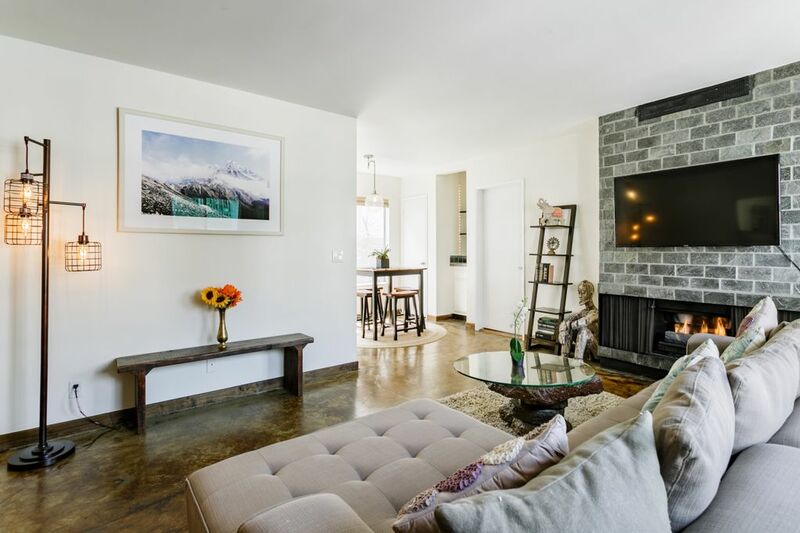 This spacious 2 bedroom apartment is one of the best kept secrets of Venice Beach. Just a block away from the beach! Enjoy the beautiful and modern beach-inspired furnishings, large windows, local artist designs, luxurious King bed in the master with 32” flatscreen TV and 2 Queen beds in the guest suites with organic cotton linens and pillows. Take advantage of the full kitchen and wet-bar, high-speed WiFi, 50” Samsung flat screen SMART-TV that's Netflix/Hulu/Amazon connected, and entertainment system in the living room, built-in water filtration system for drinking and showering pleasure and custom stained rock and bamboo floors. You’ll have full access to a private deck off the master suite and the BBQ in our Veranda and Zen garden, makes for the perfect place to watch sunsets, read a book or meditate. You can expect all the comforts of home with a true Venice experience. It's perfect for families and business travelers and we have additional bedding to accommodations up to 8 people. We have two queen size beds in the guest room, a king bed in the master suite, our l-shaped sofa can comfortable sleep one, and we have an airo-mattress that can sleep 1 or 2 (available upon request only). We're located on a quiet and lovely walk-street, just one block from the ocean and a minute's walk to the Venice Pier, Boardwalk, and Canals, where you can find amazing restaurants and entertaining day/night life. You will enjoy bicycle and walking paths along the oceanfront with the best people-watching in L.A. Stay active with the world-famous Muscle Beach, beach volleyball courts and surfing in your own backyard. Within walking distance are health spas and yoga studios. Dine at one of the many restaurants just around the corner or enjoy the sunset at one of the rooftop bars. A 5-min bike ride takes you to the many boutique shops, restaurants and galleries on Abbott Kinney Boulevard, and we provide rental bikes for your convenience! The location is within a 15 minute drive from LAX is costs around $24 plus tip. You can also use Prime Time Shuttle for a shared ride. Pets considered for an additional fee. *Our laundry facilities are on-site and shared with other guests on a first-come, first serve basis. To access, enter the patio on the right side of the building. Open the grey gate door and the laundry is towards the back on the left side. Our cleaners often use the machines between 11am and 4pm, but you are welcome to use any time before or after. CHECK IN/OUT: Standard Check-in time is 4pm and Check-Out at 11am. We are happy to work with you on flexible times if possible, however we do need at least 48-hours notice for late check-outs or early check-ins. Please expect a charge of $50 for early check in or late check out. ADDITIONAL GUESTS: Please expect a $30 charge per additional guests over the allotted 4 per reservation. BABY AMENITIES: We have a changing station and a Graco Pack N' Play on the Go Playard that can be rented for $10 a day with prior notice. Please let us know in advance if you need these items. Please not that this unit does NOT have central heat or air conditioning. We do provide space heaters and fans. Temperatures are typically very mild and comfortable. We're local Venetians who enjoy health and wellness, surfing, yoga and traveling. We can tell you all about the local spots to check out and we like to greet all guests with keys and a quick tour of the property. There is almost always a property manager nearby if you need anything. We're very responsive to your calls and love to provide local suggestions for your stay in Venice! The place comes with one free parking space. Additional parking available for $15 per night per extra car. Bikes for rent at $20 each per day, up to 6--available on a first come, first serve basis. Surf lessons available!! The property manager is on site, and will happily arrange any special request. Great condo ideal location fully equipped ! Great condo we are a family of 6 adults and had a fab time the condo is spacious the beds are very comfortable and lots of fans to keep us all cool even our trip to the beach which is just down the road we had beach chairs, towels,a football, and body boards. Just a short walk to restaurants and cafes ideal location for Venice beach. Any questions I had the response was immediate was a great find and we would definitely go back hopefully longer next time. Thanks for staying with us, Sue! We hope to welcome your family back again soon! Rooms and space was very clean stocked full of everything we would need to feel at home. The master bedroom bed was amazing. Water pressure in the place was great throughout. Only thing that would have been more useful was some cleaning products present in the condo to help clean up be a little easier. Great location, short ride from almost everything you need. Right next to Washington Street which is along Venice Beach. Also the smartlock is super dope. Helps check-in and check out run super smooth. Great location with everything we needed in the unit. Would diffinently rent again when visiting our grandson. Definitely recommend the Zen up condo if you are looking for great space in the Marina Del Ray area. Just about a block off of the beach, the condo is comfortable and the property management was friendly and responsive. Although happy to say that we didn't need them outside of answering one or two questions during our stay, because everything was in great shape and we had all we needed! We found the beds to be super comfortable and the parking was a huge convenience for us. We walked to restaurants and shops daily and appreciated the easy access to the freeways when we ventured to other parts of the city. Great place, close to the beach. We were here for the Rose Bowl across town and getting there wasn’t a problem. Parking was easy. We had a large family (5 adults, 3 kiddos) and had place for all of us with sharing rooms. I wouldn’t do a larger group than that though. Thank you Jason & Andrew! Discover the carefree vibration of the Marina Peninsula – the ideal home base for your LA stay. The 2-bedroom, 2-bathroom upper unit apartment is located 2 blocks from the beach, directly south of the Venice Pier. We are a bottom unit also 2/2 so when inquiring about the place make sure to specify the unit you are interested in (see photos). We are steps from the Venice boardwalk and the iconic canals. You can enjoy bicycle and walking paths along the oceanfront with some of the best people-watching around. Stay active with the world-famous Muscle Beach, beach volleyball courts and surfing in your own backyard. Within walking distance is a health spa and yoga studio. Dine at one of the many restaurants just around the corner or enjoy the sunset at one of the rooftop bars. You may also tour museums, view Art galleries and/or shop the vintage boutiques on Abbott Kinney Boulevard. Our location is minutes away from LAX, and all of the the excitement happening in Los Angeles and Santa Monica.